Good morning! Quick post for today... I didn't have a lot of stamping time over the weekend, but I did just manage to finish this simple card. 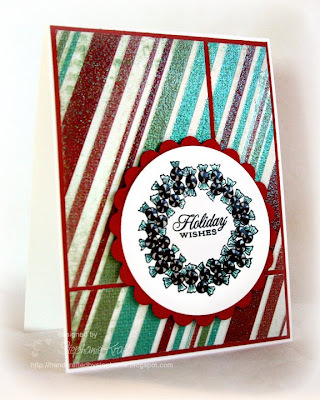 My image is Lockhart's Candy Wreath and my sentiment is from Papertrey Ink's 2008 Holiday Tag Collection. I used Taylored Expressions Sketch #91. Accessories: Circle and Scalloped Circle Nestabilities (Spellbinders), Markers (Copic), Liquid Glass (CTMH), Foam tape. This is so pretty! I love the shimmery paper!